Technological, economic, and regulatory changes are some of the driving forces in the modern world of finance. For instance, financial markets now trade twenty-four hours a day and securities are increasingly being traded via real-time computer-based systems in contrast to trading floor-based systems. Equally important, new security forms and pricing models are coming into existence in response to changes in domestic and international regulatory action. Accounting and risk management systems now enable financial and investment firms to manage risk more efficiently while meeting regulatory concerns. The challenge for academics and practitioners alike is how to keep themselves, and others, current with these changing markets, as well as the technology and current investment and risk management tools. Applications in Finance, Investments, and Banking offers presentations by twelve leading investment professionals and academics on a wide range of finance, investment and banking issues. 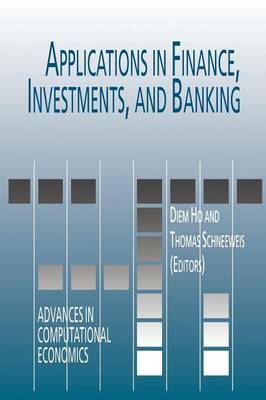 Chapters include analysis of the basic foundations of financial analysis, as well as current approaches to managing risk. Presentations also include reviews of the means of measuring the volatility of the underlying return process and how investment performance measurement can be used to better understand the benefits of active management. Finally, articles also present advances in the pricing of the new financial assets (e.g., swaps), as well as the understanding of the factors (e.g., earnings estimates) affecting pricing of the traditional assets (e.g., stocks). Applications in Finance, Investments, and Banking provides beneficial information to the understanding of both traditional and modern approaches of financial and investment management.